Click here for audio of Episode 395. Today, we meet a modest giant. The University of Houston's College of Engineering presents this series about the machines that make our civilization run, and the people whose ingenuity created them. William Herschel, the astronomer who discovered Uranus, was 50 when he married. He was 54 when his only son, John, was born in 1792. John was raised by a cheerful mother, a famous father, and a maiden aunt, Caroline. Caroline was also an astronomer of first rank. It was she who discovered the nebulae in Cetus and Andromeda. For 56 years she and John were joined by a great bond of affection. The household was more than a home. It was also an observatory. The grounds housed the largest reflector telescope in the world. It was 40 feet long with a 48-inch mirror. You might say John was born with a silver telescope in his eye. At first, John studied mathematics at Cambridge. Charles Babbage, who later invented the programmable computer, was John's age and a close friend at Cambridge. Together they founded the movement that brought Leibniz's calculus into English use. After Cambridge, William wanted his son John to go into the Church. John picked up a law degree instead. But he had no taste for law and went back to Cambridge to teach math. By then, his aging father needed help with his work. So the circle finally closed. John left Cambridge to take up his third field -- the family trade of astronomy. As an astronomer, John turned the field toward issues of mathematical optics. He studied double stars. He updated his Aunt Caroline's great catalog of nebulae. 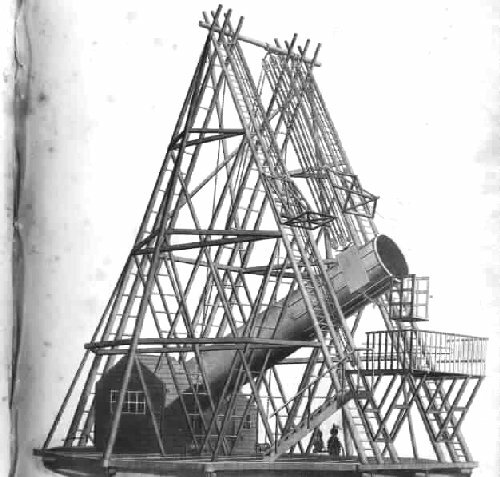 Then, in 1833, John packed his family, a 20-foot telescope, and three reflector lenses off to Cape Town. Most astronomers had worked in the northern hemisphere. The southern skies were almost uncharted. Five years later, he'd filled in the blanks. He rewrote astronomy under the clear air of agrarian Africa. It was a remote world, perfectly suited to his quiet temperament. Back in England, he picked up an old interest in chemistry. Then he heard about Daguerre's invention of photography. With his knowledge of optics and chemistry, Herschel invented his own camera within a week. In 1839 he took the first glass-plate photograph. It was a picture of his father's old 40-foot telescope, now a half-century old. He didn't make the slightest move to gain credit or profit from this inventive tour-de-force. But then John Herschel threw the veil of modesty over all his dazzling accomplishment. His last feat was to create an accurate translation of Homer's Iliad into English hexameter. In the end, this gentle man went to his death sure that he was only a pale shadow of his remarkable father and his aunt. In the end, though, I think that's the way he wanted things to be. Buttmann, G., The Shadow of the Telescope: a Biography of John Herschel . New York: Charles Scribner's Sons, 1970.